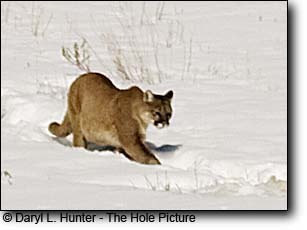 On the Wildlife Safaris and Yellowstone Tours I lead in Yellowstone what my clients hope too see more than anything else is a wolf and I must confess during the best wolf watching times of the year I drop all I am doing too spend all free time photographing wolves and grizzlies. 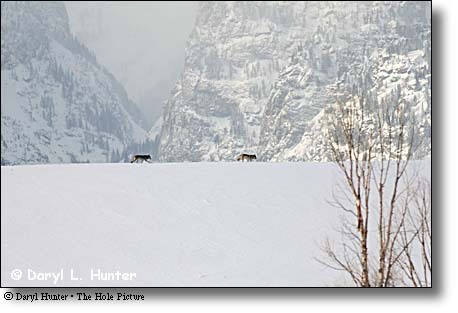 Two wolves traveling north ten miles north of Jackson Hole Wyoming in Grand Teton National Park. The mouth of Death Canyon of Grand Teton Range is in the background. 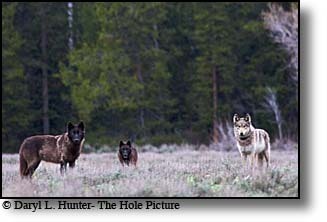 Populations of wolves have been increasing in the states around the Yellowstone area, and their fate continues to be debated among researchers, ranchers, environmentalists, and other public citizens Hunting and other measures will keep the population between 880 and 1,250 after delisting, according to Ed Bangs, wolf recovery coordinator for the U.S. Fish and Wildlife Service. Environmentalists argue 2,000 or more gray wolves are needed before protection should end. 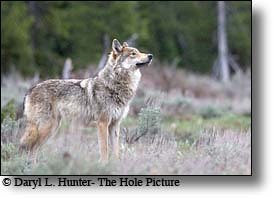 A proposal from Ed Bangs, and the Fish and Wildlife Service would allow ranchers and trappers to obtain permits to kill wolves so that livestock depredation from wolf over population, will stay minimal. Protection would resume if wolf populations decreased to fewer than 450 wolves in the region; if the number goes down to 300 the species would be reinstated to the protected list. A grey wolf appears to pose for camera in Jackson Hole Wyoming. Wolves also play an increasingly important role in the Northern Rocky Mountain region's economy. According to a recent study, the roughly 151,000 people who visit Yellowstone National Park each year to see wolves generating $35 million annually to Montana, Idaho, and Wyoming. Nearly four percent of Yellowstone National Park's 3.15 million annual visitors (2007) say they would not have visited the nation's oldest national park if wolves weren't there. 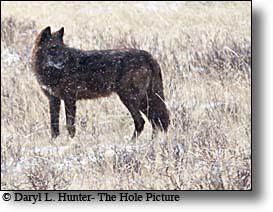 Black Wolf of the Agate Pack during spring storm in the Lamar Valley fo northern Yellowstone. There are numerous companies happy to facilitate the aspiring wolf observer on a guided trip, but as a Safari leader myself you must realize that, like fishing, some days you are going to get skunked. 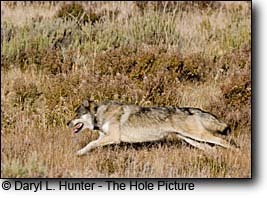 You greatly increase your chances of seeing wolves if you are in wolf territory before the sun comes up as this is prime hunting time. 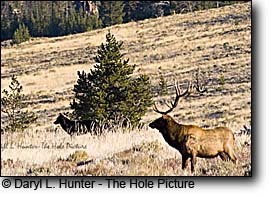 This was a fun encounter, I was driving a dirt road in the Jackson Hole backcountry knowing wolves were in the vicinity, cruising slowly I saw a cow elk on the treeline of a meadow. She suddenly broke into a run, I know the wolves were on her tail. I bailed out of the car, camera in hand, dropped to the ground in the hope of including the tops of the mountains in a telephoto shot and as I sat there in a pile on the ground the wolves stopped their chase to inspect the pile of human on the ground. These wolves see people all the time but not on the ground. They took several steps toward me sniffing and starring until the finally figured out I wasn't food and would probably leave a bad taste in theri mouth. Gibbon Pack wolves feeding on Bison beside the Gibbon River of Yellowstone National Park. 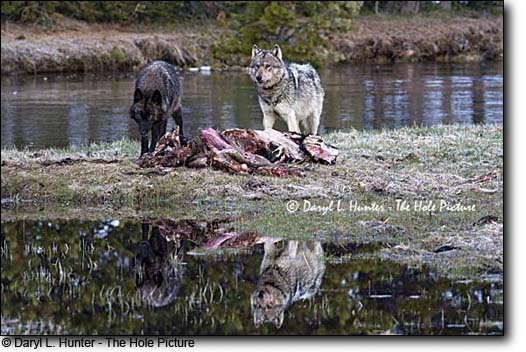 I was photographing these wolves for twenty minutes before I saw their reflection in the snowmelt pool in front of them. 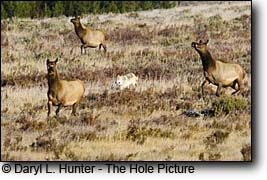 Confused elk chasing wolves in the Swan Lake area of Yellowstone? 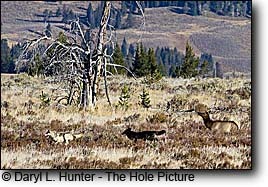 Grey Wolf in hot persuit of an elk dinner. 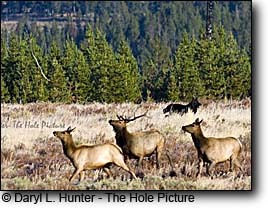 While photographing this bull elk the black wolf made a surprise appearance in my view finder. 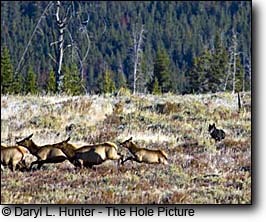 Black Wolf chasing elk south of Mammoth Springs. A grey wolf appears to pose for camera in the Lamar Valley of Yellowstone National Park. A grey wolf howls after awakening from a nap. I couldn't help but wonder if he was trying to wake up his buddies so they could go back to work. 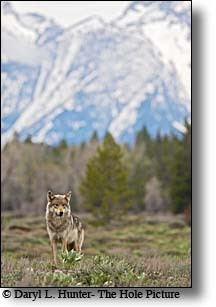 Grey Alpha female of the Pacific Creek Pack that roams northern Grand Teton National Park. 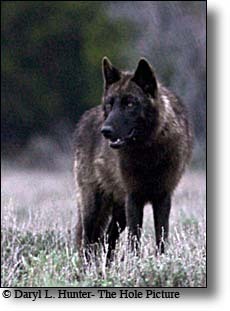 Black Wolf, part of the Pacific creek pack that roams northern Yellowstone.